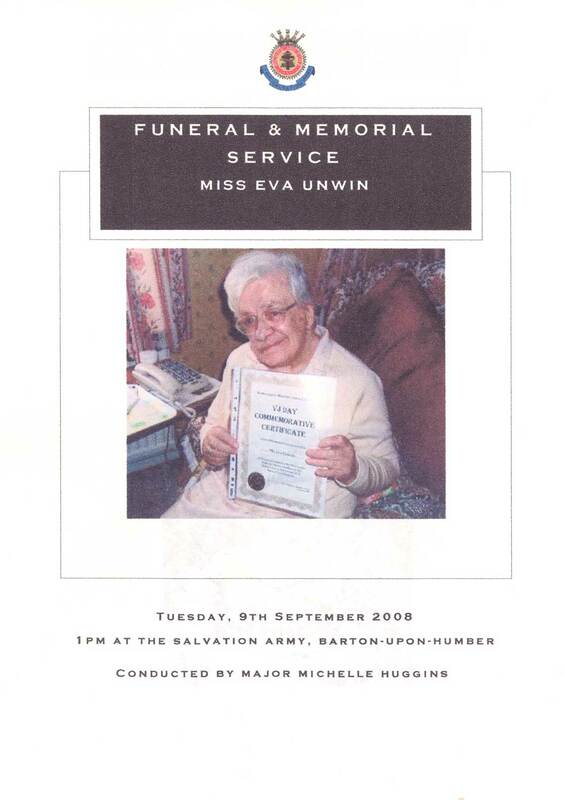 Eva Unwin died on 1st September 2008 after a long battle with cancer in her 90th year. 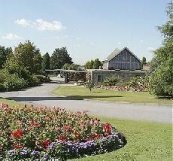 A memoral service was held at the Salvation Army, Barton upon Humber conducted by Major Michelle Huggins followed by cremation at Woodlands Crematorium, Scunthorpe, Lincolnshire on September 9th 2008. This afternoon we gather to celebrate the life of Eva Unwin. It is worth celebrating because it was long, full life. It is worth celebrating because she was a courageous, witty, warm and articulate woman who will be greatly missed by her family that we are so pleased to see here this afternoon, by the home where she lived, by her friends, and by us here at the Salvation Army. Before we continue however, let us thank God that he is with us as we join in this special time of remembrance. Let us pray: "Father God we thank you for your presence here today. We would ask that as we say goodbye to a very special lady, you will steady us and strengthen us. That in the midst of sorrow we will be able to celebrate a life well lived. Enable us to say thank you as well as goodbye. May your love and comfort be more real to us today than at anytime we have known. We ask this in your name. Amen." We have come to say farewell to Auntie Eva. Although in reality we were first cousins once removed, old habits and titles die hard. She was the aunt we never had as both our parents were only children and she did not have children of her own. We have known Eva for the best part of sixty years (that's the whole of our lives - and two thirds of her own!) It is a salutary reminder that we have lost the last remaining link to both our parents and grandparents generations. Eva was three years younger than our mother and as cousins they developed an affinity which persisted into later life. Eva was born in Patricroft in the suburbs of Manchester. She went to school, to church and to work in the area. 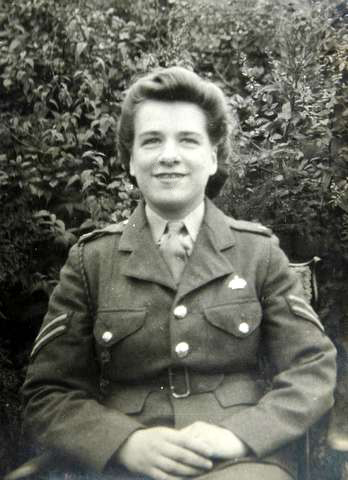 She was proud of her service in the Royal Corps of Signals during the war. We first knew Eva in the early 1950s. It became a family tradition that we took our summer holidays with them in Swinton (from which many of our earliest memories of the seaside sprang) and they came to us in Leicester for Christmas. She loved organising birthday and Christmas parties and entertaining the kids. Eva was down-to-earth, forthright in her opinions and fun. She was devoted to her father and after her mother died she looked after him (and he her) until he died aged 97. She suffered more than her fair share of ill health over the years. Several major neurosurgical operations left her with a paralysed face, deafness and a poor sense of balance, a disability she coped with without complaint for nearly 25 years. Ten years ago she developed an internal tumour for which she required surgery and chemotherapy. However she said herself it wasn't a question of her living with the cancer but rather that it learned to live with her. Through all her adversity she remained remarkably cheerful and, until very recently, stoically independent. She loved to travel and never lost her appetite for a good meal and a glass of sherry. She was a good judge of character and did not tolerate fools gladly. She had a long memory, sharp wit and wry sense of humour and always maintained an interest in the activities of the younger generation. Latterly, amongst all her other activities, she was keen to document memories and anecdotes of her side of the family for our web site. She completed her own autobiographical pages in March this year (The long and winding road from Barton to Barton) in which she summarised herself in typical fashion: "I don’t regret my life. I never got married. I guess I didn’t fancy it. Everyone thought I was too bossy anyway. I said to my mother that it’s evident I’m not going to get married so I’m going to have some good holidays. I’ve been all over the place. So a good holiday beats a good husband any day!!" Auntie Eva, we will miss you. I was fond of Eva. She was a member of Home League here at Barton and one of the things that I picked up from her was that she had a dry sense of humour and a quick wit. And the bravery that she showed dealing with her cancer astounded not just myself. I was not, therefore, surprised to read some of her own thoughts and reflections on the Craxford-family website. Alan kindly forwarded me the details and some of her recollections brought a real smile to my face as I read them. I had wondered why Eva had never married, but my question was answered thanks to Alan and the Craxford Family website. It is typical, frank Eva – "A good holiday beats a good husband any day’!." Jo Credland and I were talking about Eva yesterday and saying how she would give some of the crafts she had made at Tofts Road to our children. We have two stained glass effect Christmas decorations that now hang every year on our Christmas tree courtesy of Eva. We here, would mostly remember her for the courage in which she faced her illnesses. Operations on a growth to her inner ear left her with the right side of her face paralysed, and for 10 years she fought cancer. Even though it was eating away at her face, she still got out and about, and didn’t let her disabilty or disfigurement get in the way of her activities. Let us share a word from Scripture: (2 Corinthians 5:1-2, v8) "Now we know that if the earthly tent we live in is destroyed, we have a building from God, an eternal house in heaven, not built by human hands. Meanwhile we groan, longing to be clothed with our heavenly dwelling…..We are confident, I say, and would prefer to be way from the body and at home with the Lord." Let us share a time for reflection: "There was a little girl who walked to her house through the cemetery every day after school. She loved to feel the breeze in her hair and to watch the birds. Sometimes she just threw herself on the rich, green grass, and watched the clouds turn into castles and angels and great white stallions. She loved hearing the birds singing. As she skipped around gravestones, she whistled her favorite tunes and sang songs. At times she knelt down, and read the names and dates on the tombstones, and slid her fingers over the beautiful pieces of granite. Her friends asked her, “Why do you walk through the cemetery every day?” She always answered, “Because, it’s the way home”. For many death is something to be feared as they see it as a travesty, a time of ending. They fear that unknown time when time ceases, and all things appear to come to an end. But is it an end? When we come to the funeral of a loved one, for us it is a time for saying goodbye. We are marking the end of our relative, friend, neighbours earthly life. Funerals seem like a time for conclusions. But is it really the end? Well for those who have accepted Christ it would seem that death is just a door to a new life, it is a way home to he Father. It is not an ending, but a beginning. Consider the words of the Apostle Paul. He did not fear his impending death, but quite the opposite: he “groaned, earnestly desiring” that he be with the Lord – and Paul knew that the only way he could be reunited with his Saviour was to pass from this life an into the next. He had to take off this cloak, this flesh, so that he could pass from the mortal to the immortal, from the lesser to the greater. Such thinking is alien to the world, but not to the Christian who has accepted Christ as his Saviour. Eva’s body had definitely groaned. It had taken a bit of a battering over the years. But now that coat has been thrown off and that feisty, bright spirit lives on unfettered. Eva believed and is therefore still very much alive, she has just moved home. Today I ask each and every one of you: Do you believe that Jesus Christ is the “resurrection, and the life”, and that whosoever believes in Him shall “never die”? If your answer is emphatically “Yes”, you will one day be with Eva in Heaven, reunited for all eternity. If your answer is “no” or “maybe”, then I grieve not for Eva, but for you. Today we thank God for Eva, for her life and her influence. But we also thank God that she has now the healing for which she has fought and a new home that will be eternal. Let us pray: "Dear God, thank you for Eva, for her life, her love, her influence. Thank you for all that she was and all she has been to each person here. Thank you that we are sad at her passing because it means that we loved her and she was valued by us. Thank you however, that she was loved by you. It is in that love that you have called her home, free from pain, free from disease. May she live on in our hearts and in our memories, but more importantly may her life continue with you. Amen." We are gathered here today to commit Eva Unwin to her final resting place, those everlasting arms. Scripture and Commital: (2 Corinthians 4:16) "Therefore we do not lose heart. Though outwardly we are wasting away, yet inwardly we are being renewed day by day. For our light and momentary troubles are achieving for us an eternal glory that far outweighs them all. So we fix our eyes not on what is seen, but on what is unseen. For what is seen is temporary, but what is unseen is eternal." As God our eternal father has allowed our friend Eva Unwin to be taken from us, we now commit her body to the elements; earth to earth, ashes to ashes, dust to dust, in the certainty of the resurrection and of the eternal wisdom and mercy of God. And now may the blessing of God Almighty, the Father, the Son and the Holy Spirit be upon you and remain with you now and always. Amen. 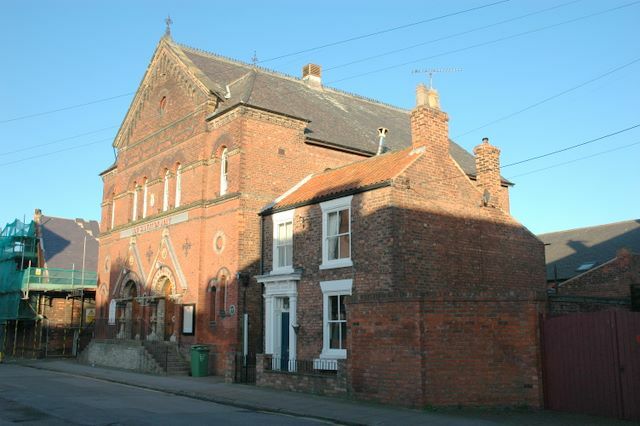 Song: "The Old Rugged Cross"
The funeral arrangements were carried out by H & HJ Huteson & Sons, Barton upon Humber (Link to website). Eva requested that, in lieu of flowers, donations should be made to the Salvation Army.